GMS Racing is eyeing a move from the Xfinity Series into the marquee NASCAR Cup Series. The Las Vegas-owned team would partner with juggernaut Hendrick Motorsports on engines and chassis. There is a distinct possibility Las Vegas’ presence in the NASCAR Cup Series will be even greater in 2017. GMS Racing is considering jumping from the Xfinity Series into stock car racing’s marquee division. If it happens, the locally owned team would partner with juggernaut Hendrick Motorsports on engines and chassis. 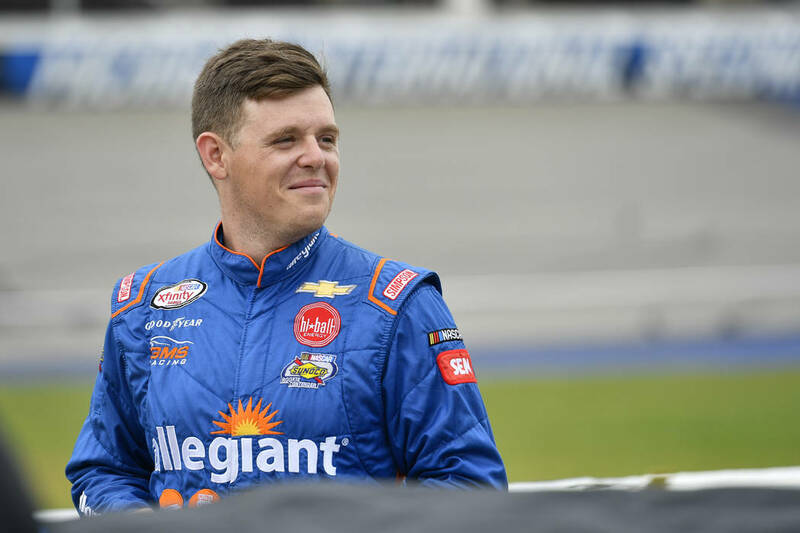 “There’s a lot of things being said, but moving up to Cup, this has always been our ultimate goal,” said Spencer Gallagher, who drives for the team founded by his father, Allegiant Airlines CEO Maury Gallagher. A decision could be made by next month. GMS, which began in 2011 in the second-tier ARCA series, now fields a full-time entry for Gallagher and a part-time effort for Ben Kennedy in the Xfinity Series. Johnny Sauter, who leads the Truck Series points, also drives for GMS, and Kaz Grala and Cup Series star Chase Elliott have won 2017 Truck Series races while flying the GMS colors. If the deal comes to fruition, it probably would be a two-car effort: One for Gallagher and one for a more experienced driver, he said. While his Xfinity results haven’t exactly lit the scoring pylon on fire — Gallagher is 18th in points and has yet to earn a playoff point — he has shown flashes of speed in the Truck Series with a string of top 10 finishes in 2016. His drivers finished 13th, 22nd and 33rd in the 101st running of the Indianapolis 500, but it still was a productive May for IndyCar team owner Sam Schmidt of Henderson. 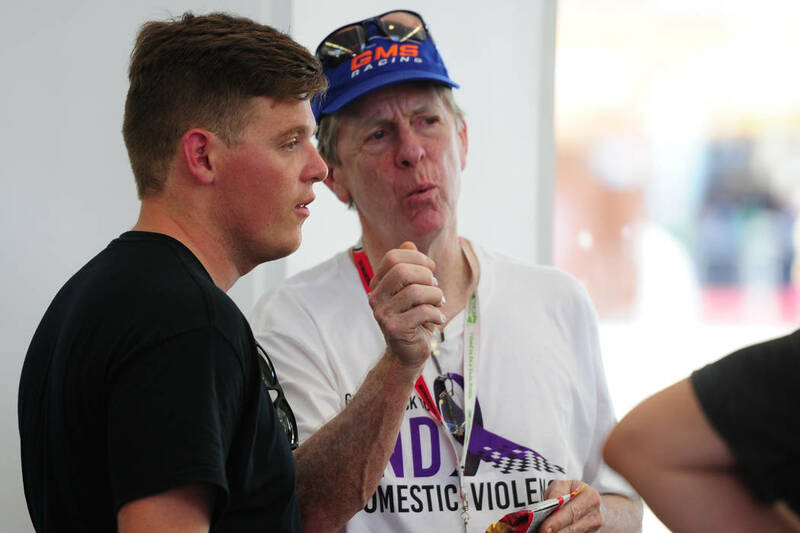 Schmidt’s Conquer Paralysis Now gala, held in conjunction with the big race, raised $501,500 — about $300,000 more than his driver Jay Howard earned ($200,05) for finishing last. — Here’s your Brendan Gaughan update heading into the Xfinity Series race in Iowa: He’s been fast much of the year; he has little to show for it; he sits 13th in points. But the 41-year-old still most likely will qualify for the playoffs (top 12) because Bubba Wallace has landed a Cup ride with Richard Petty and soon will fall off the leaderboard. This week also marks the three-year anniversary of Gaughan’s first Xfinity win, on the famous Road America road course in Elkhart Lake, Wisconsin. Happy for Old Man Tom Busch, he is racing at Race of Gentlemen in New Jersey this weekend! When: Friday, practice, noon (FS1), practice, 3:30 p.m. (FS1). Saturday, qualifying, 11:45 a.m. (FS1). Sunday, race, noon (FS1). Where: Sonoma Raceway (road, 1.99 miles), Sonoma, California. Distance: 218.9 miles (110 laps). Last year: Tony Stewart won in his final season in Cup. Last week: Kyle Larson won from the pole in Michigan. Next race: Coke Zero 400, July 1, Daytona International Speedway, Daytona, Florida. What: American Ethanol E15 250. When: Friday, practice, 11 a.m. (FS1), practice, 2 p.m. (FS1). Saturday, qualifying, 3:15 p.m., race, 5:30 p.m. (FS1). Where: Iowa Speedway (oval, 0.894 miles), Newton, Iowa. Distance: 218.75 miles (250 laps). Last year: Sam Hornish Jr. won in his return to racing after an extended absence. Last race: Denny Hamlin, starting fifth, posted his first win in the series in 2017 by less than a car length. Next race: Daytona Firecracker 250, June 30, Daytona International Speedway. When: Friday, practice, 7 a.m. (FS1), practice, 9:15 a.m. (FS1), qualifying, 3:05 p.m., race, 5:30 p.m. (FS1). Distance: 175 miles (200 laps). Last year: William Byron won for the second week in a row. Last race: John Hunter Nemechek picked up his fourth career victory. Next race: Buckle Up In Your Truck 225, July 6, Kentucky Speedway, Sparta, Kentucky. When: Friday, practice, 7:45 a.m., practice, 12:15 p.m. Saturday, practice, 8 a.m., qualifying, noon. Sunday, race, 9:17 a.m. (NBCSN). Where: Road America (street, 4.014 miles), Elkhart Lake, Wisconsin. Distance: 220.77 miles (55 laps). Last year: Will Power won from the pole. Last race: Power won in Texas, his 31st victory in the series. Next race: Iowa Corn 300, July 9, Iowa Speedway. When: Saturday, qualifying, 10 p.m. Sunday, race, 10 p.m.
Where: Baku City Circuit (circuit, 3.73 miles), Baku, Azerbaijan. Distance: 190.17 miles (51 laps). Last year: Nico Rosberg snapped a three-race winless skid. Last race: Lewis Hamilton took first in Montreal. Next race: Austrian Grand Prix, July 9, Red Bull Ring, Spielberg, Austria. What: Summit Racing Equipment Nationals. When: Friday, qualifying, 3:30 p.m., qualifying, 6 p.m. Saturday, qualifying, 10:30 a.m., qualifying, 1 p.m. Sunday, finals, 12:45 p.m. (3 p.m., taped, FS1). Where: Summit Racing Equipment Motorsports Park, Norwalk, Ohio. Last year: Shawn Langdon won in Ohio, his second consecutive victory. Last race: Clay Millican won his first career race. Next race: Route 66 NHRA Nationals, July 9, Route 66 Raceway, Elwood, Illinois.